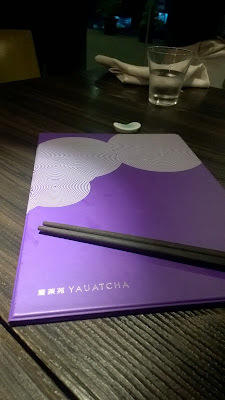 I have been to Yauatcha many times, I have also written a blog post about their new additions. 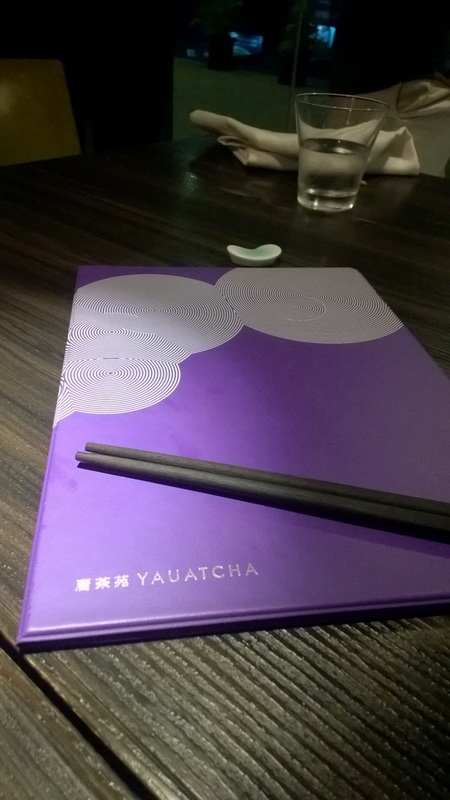 As you would have read Yauatcha is an asian/chinese restaurant which serves great cantonese food which is one of the Eight Culinary Traditions of Chinese cuisine. Yauatcha is actually wordplay on the Cantonese phrase ‘Yum cha’, which means ‘to drink tea’- traditionally. But this visit was all about dim sum trail which was held during the 4th FBAB (Food Bloggers Association Bangalore) meet. 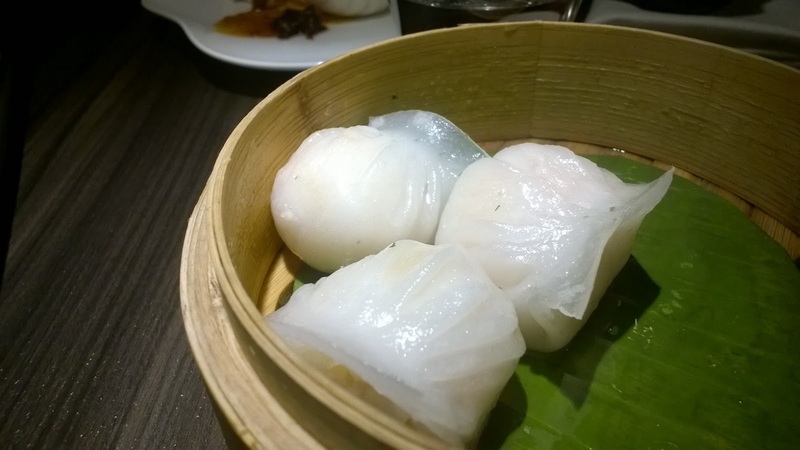 You can avail the dim sum trail between 12 noon and 7PM. It cost Rs. 2000, all inclusive which is served for a minimum of 2 people. 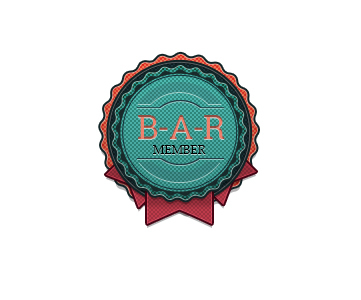 You can choose any 6 varieties out of 6 vegetarian and 7 non-vegetarian options. Yauatcha decided to choose 6 variants for the bloggers on the table. Started with vegetable crystal dumpling and Chicken char sui bun. I have both of these in the past and they taste really good. 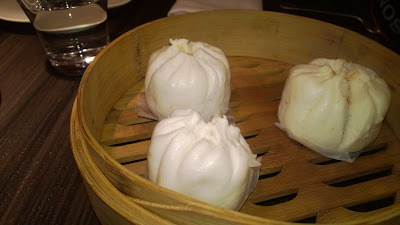 The Chicken char sui bun is a little sweet but I have never had such a dim sum anywhere else so its turns to be my favorite. 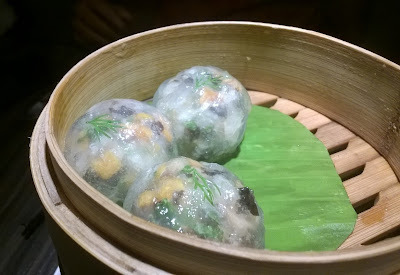 The Vegetable crystal dumpling was a clear dim sum where I could see the vegetables inside and taste good with a sauce. Baked vegetarian chicken puff, it contains egg and baked chicken puff was next. I got to try the Baked chicken puff and it was indeed good to taste. Oh by the way you read it right, the other one on the table was baked vegetarian chicken puff which was a vegetarian option. Prawn Har gau was next, a simple prawn dumpling filled with flavors. 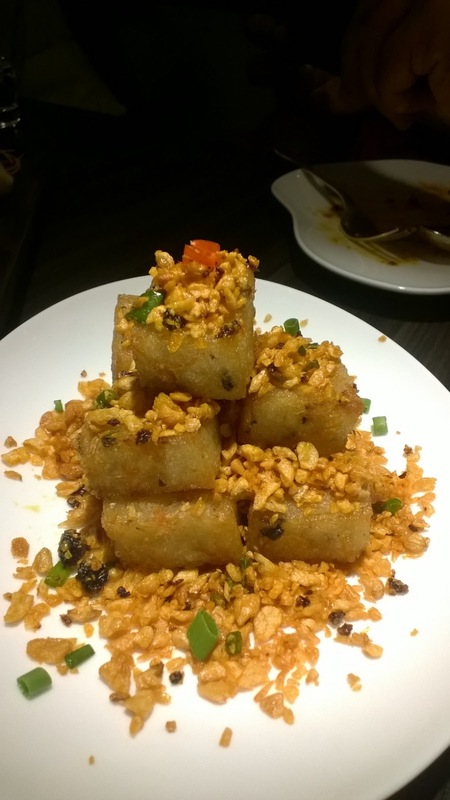 Fried turnip cake with vegetables was next on the table and is supposed to be their speciality. The vegetarians loved it while I did not like it much. Crispy duck roll and Crispy asparagus, pumpkin and corn roll was next. 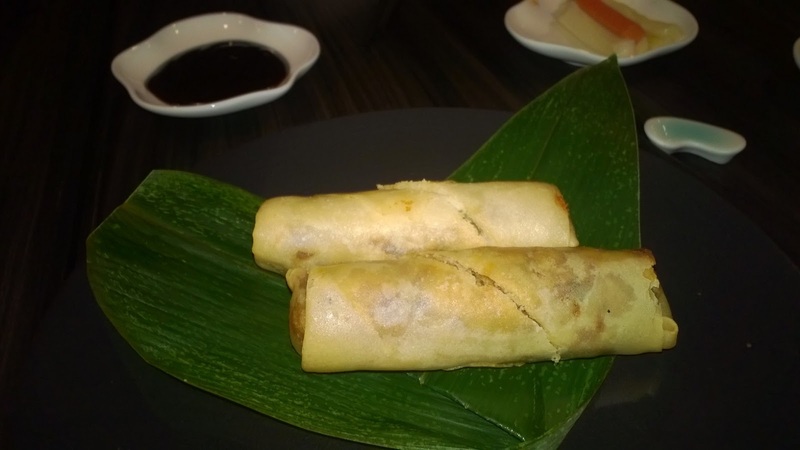 I have had the Crispy duck roll earlier and I still did not get the taste of the duck meat much. The veg roll was better. Chicken char sui cheung fun was the last one. 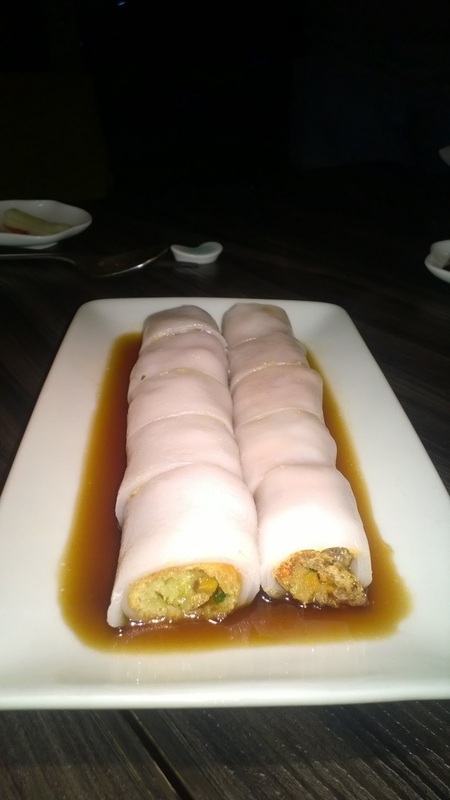 The vegetarians had Crispy vegetable cheung fun. I am never found of cheung fun because of seasoned soy sauce. 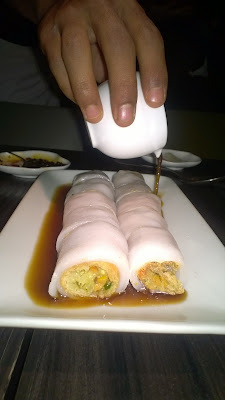 I would never mind eating the rice noodle roll lightly dipped in the sauce. 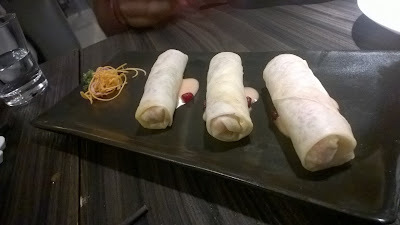 After this yummy dim sum trail, dessert platter was on the table. It had 4 desserts. Selection of macarons, Religieuse, Chocolate hazelnut mousse and Jasmine tea cake was on our platter. 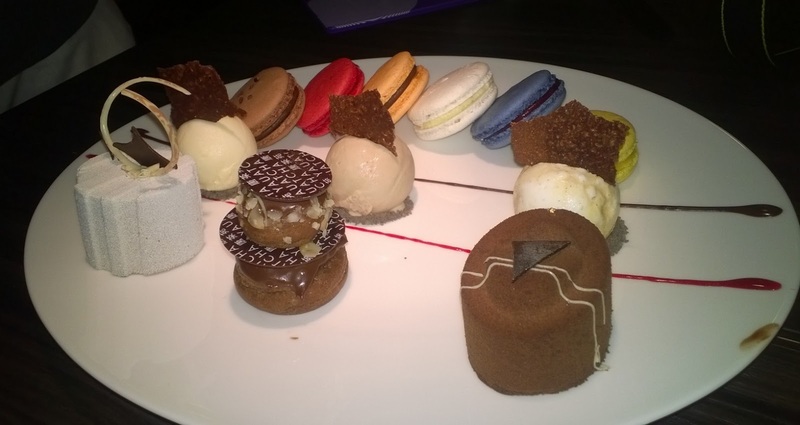 I guess the best way to enjoy the desserts at Yauatcha is when you share them. Having them all alone is no fun. Moreover they are amazingly good looking desserts. The dessert platter is priced separately. 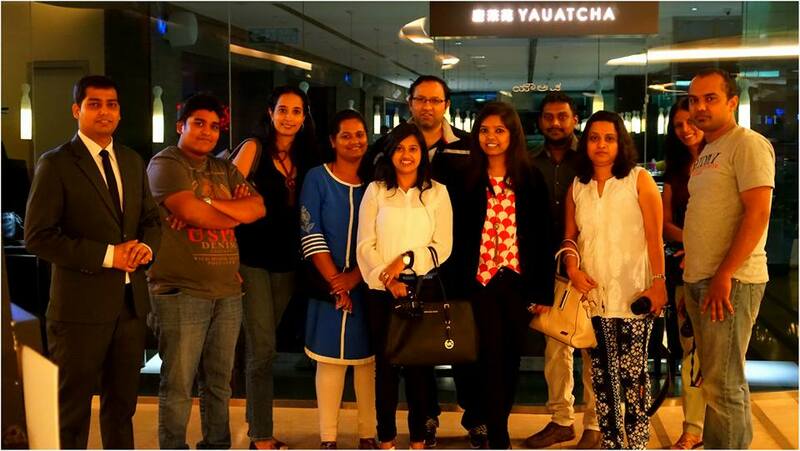 It was a fun evening with loads of talking and dim sum tasting. 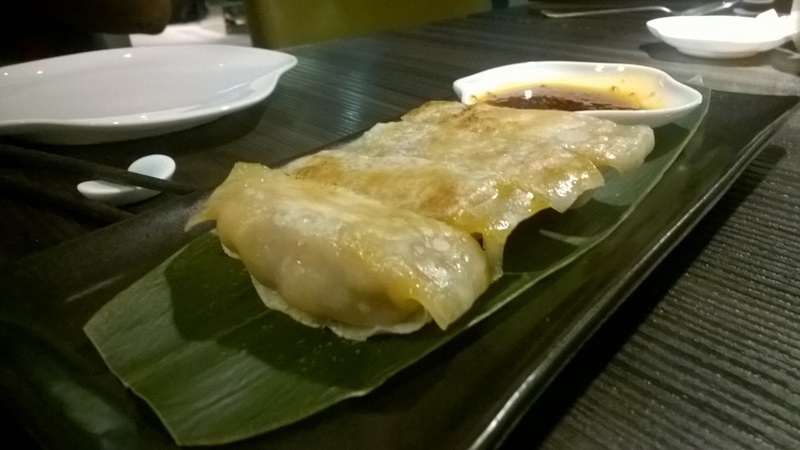 Those craving to try only dim sums for their meal or pairing with tea, this would be the best option.